The Indian Red Scorpion is considered the most lethal of all scorpions. But despite its reputation, it only stings as a last resort. And rather than humans, it prefers to feast on insects, like roaches. Scorpions. About 1500 species in all. Living on every continent except Antarctica. Of that 1500, only a few dozen are potentially lethal to human beings. 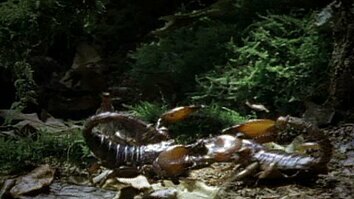 And of those, this one, the Indian red scorpion, takes the prize as the most lethal of all. The Indian red is tiny…it’s no bigger than a cigarette lighter. But it possesses a potent elixir. And when it lives near people, it often takes shelter where they do. In countries like India, scorpion stings are a serous public health issue, particularly among children, where the unclad foot of an unwary youngster can lead to a painful and in some cases if left untreated deadly sting. Scorpions are arachnids just like spiders, ticks, and mites. 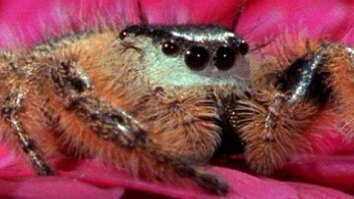 They have four pairs of legs for walking, a pair of pincers for grabbing and holding prey, and mouth parts known as “chelicerae” used to chew food. The body tapers ending at their infamous stinger. But, despite their rather fearsome reputation, they usually only sting as a last resort. Scorpions are shy, nocturnal animals that usually lie in wait for their prey. And once their victim is captured –either clasped in the scorpions’ pincers, or poisoned by a deadly sting, like this roach- digestive fluids turn the meal to liquid, that can be sucked into the scorpion’s stomach. And what’s left, is cast aside.